Todos tenemos nuestra receta favorita de torta de chocolate, ¿o no? Esa en la que el libro de recetas se abre solo… Esta la introdujo en el recetario familiar la Tía Anita, hermana de mi abuela, y es nuestra favorita. Una cosa que me encanta de esta receta en particular: que no hay que ablandar la manteca, derretir barras de chocolate ni batir nada a punto nieve… se mezcla todo con un poco de ganas y ¡al horno! Tan fácil de hacer como las que salen de una cajita, pero ¡muchísimo más rica, y con un borde crocante espectacular! 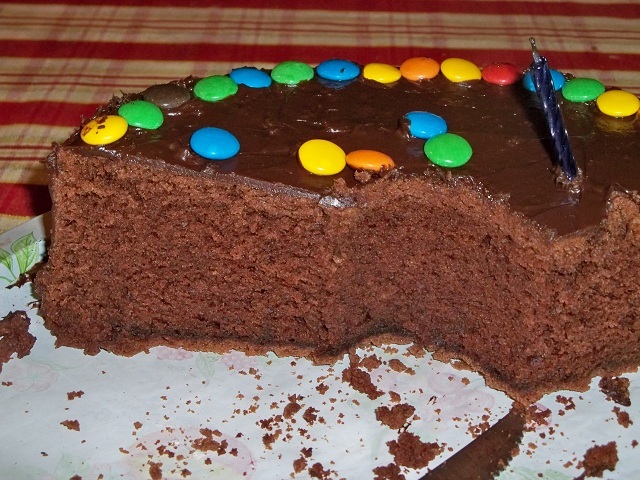 We all have a favorite chocolate cake recipe, don’t we? You know, the one the cook book falls open on. This one was introduced to the family recipe book by Tía Anita, mi Granny’s sister, and is our favorite. One thing I love about this recipe in particular: there is no creaming of butter, no chocolate bars melting, no heavy whipping – just mix everything thoroughly and pop in the oven! Just as easy as those from a cake mix pack, but oh-so-much-yummier, and with a crisp top too! En un bols grande batir los huevos con el azúcar y la escencia hasta que estén bien espumosos. Agregar el aceite batiendo continuamente, después el cacao y la harina (y el coco rallado si se usa) y por último el agua hirviendo mezclando suavemente. Verter en un molde grande, preferentemente savarin, enmantecado y enharinado. La torta crece mucho al cocinarse. Cocinar en horno moderado, hasta que un escarbadientes o cuchillo pinchados en el centro salgan limpios. Dejar enfriar un poco antes de desmoldar. In a big bowl beat together the sugar and eggs with the essence until frothy. Add the oil slowly, beating well all the time. Add cocoa and flour (an coconut if using it). Finally, fold in the hot water, and mix softly. Pour in a buttered, floured cake pan, if possible ring shaped. Use a big mold as the cake grows a lot. Cook at a moderate heat until a toothpick or knife inserted in the middle comes out clean. Let it cool a bit before turning it out of the mold. I’m not suggesting any frosting, as it goes well with any one – even unfrosted it is delicious, with the side that was open to the air deliciously crisp!